I have never read anything quite like Dr. A. B. Granville’s autobiography. To hold such a book in one’s hands; to feel the weight of the 144-year-old pages, covers and binding; to smell the attendant must and dust; to read of one man’s life, his own record, set in such sharp, precise type; to turn the thick, stiff pages, especially while one is positioned comfortably below a whirling ceiling fan on what is, after all, just another hot, humid, incredibly buggy August afternoon or, better yet, evening, after the day’s sweat has been washed away, on one’s own sofa in the middle of nowhere America at the start of the twenty-first century: it is a panacea. A. B. wrote his memoir when in his late eighties in consultation with the journals he had kept throughout his life, and the tome was then completed and edited by his youngest daughter after his death. The reading of the book (and I am just now in year 1814, Chapter XXIII) has taken me from late eighteenth century Italy to Greece, its various islands, to Turkey, Spain, Gibraltar, Portugal, England, the West Indies – A.B. starts at the very beginning. On the seventh day of October, 1783, at early morn, at Milan, Maria Antonietta Rapazzini added a third son to the progeny of Carlo Bozzi, her husband, which in process of time extended to the number of nine children, of all of whom I remain solitary survivor. Soon I read of how I would like to die, like A. B.’s grandfather. He was in the act of sipping his chocolate in bed one morning when he expired, eighteen months before reaching a century. And I agreed with the following. There is no book, whether on general or special subjects, however insignificant, out of which a reader may not learn something he was ignorant of before. Likewise, in the written life of any individual, however obscure, who has devoted himself to the public service, there will be found in the narrative of its events, faithfully and unreservedly told, some facts, some occurrences or adventures, useful and instructive to some, amusing (perhaps the contrary) to many others. A. B.’s treatise on Turkish dress illustrates this point, as I felt I learned a lot and was highly amused, particularly by the sash and waltz. As regards the Turkish costume I may, in my character as a physician, make one or two remarks in this part of my memoirs concerning it. I wore that costume a sufficient length of time to authorize me to express an opinion respecting its superiority over the modern European style of dress, whether with regard to health and the proper development of the human frame, or its suitable and decorous appearance. In each of these requisites the oriental costume indisputably bears away the palm of superiority. The surface of the human body in a state of complete civilization requires to be protected, both winter and summer, from the influence of capricious and frequent changes in the atmosphere by which it is surrounded. The covering should be proportioned to the degree of protection required, and should be uniform for the entire surface. It ought to be of ready and easy application, with few impediments and contrivances to occasion loss of time and temper. It should be free from all tight ligatures, whether partial or general, that tend to impede the free circulation of the blood. It should invest the whole person with becoming decency; lastly, it should not interfere with the free action of all the parts of the external organization. 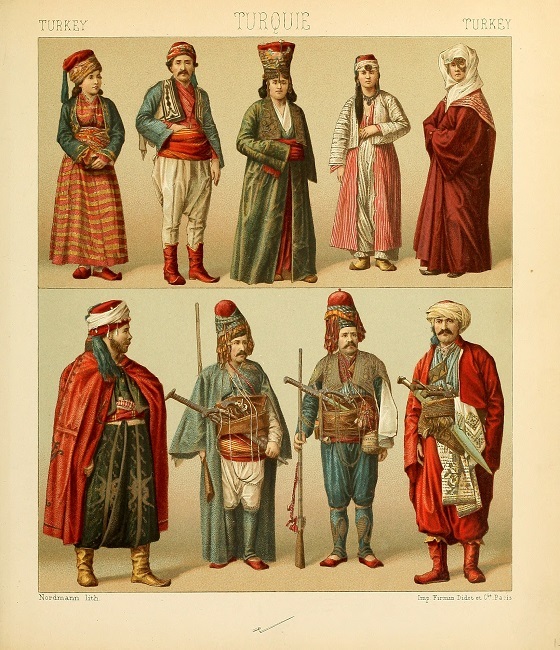 Now each and all of these requirements are attained with the Turkish costume. In five minutes after quitting your couch in the morning, and your general ablution performed, you may don it, and it is as quickly thrown off in the evening when you retire to rest. Every part of the body is uniformly covered. You may even dispense with an attendant to put the long wide sash or shawl round your waist, which is de rigueur; for if you fasten one end of it to the key of your bedroom door, and stretch the shawl to its full length by going towards the opposite wall, you may roll yourself neatly up in its folds, keeping the straight end tight in one hand while you waltz round on your return to the first end, which you then detach and tuck in at the waist. The operation used to occupy me one minute exactly. From the Smithsonian Libraries Image Gallery. I cannot adequately express, as I felt it on the occasion, the vivid satisfaction, nay more, the delightful feelings experienced when, on a sunny morning, and better still on the declining of the sun, with a round and blue canopy over my head, I stood erect on one of the loftiest pinnacles of this curious group of rocks, surveying the immense Atlantic, as smooth as the Lago Maggiore and as blue as the lake of Geneva, without one token of life but my own breathing. And the odd bits of detail that get thrown in, like something wonderful you taste in a tossed salad but you have no idea what it is. In 1812 he is stationed in the Mediterranean, growing a bit bored, hoping to return to England, where he had begun making his home. It was ultimately arranged, that as I was to be a principal witness in the intended court-martial on Lieutenant Donnellan, late of the Maidstone, and nephew to the well-known Captain Macnamara, who shot his opponent in a duel for insulting his dog, I might be sent home with him in the Impregnable, which was under orders to return to England. Shot in a duel for insulting his dog? Thus do we go on acquiring wisdom as we progress blundering through the world.